Duck Comes Back From Dead. Twice. A duck that survived being shot and spending two days in a refrigerator has now overcome major surgery — despite briefly dying on the operating table. Florida vets working to repair gunshot damage to Perky’s wing panicked when the duck twice stopped breathing. But they managed to resuscitate the bird, who leapt to fame when she was found alive in a hunter’s fridge two days after being shot. Perky now has a pin in her wing, but is expected to make a good recovery. The ring-neck duck entered surgery with vets confident that she would survive the procedure despite serious injuries to her wing, leg and beak. But they struggled to fully sedate Perky, who briefly lost consciousness, said Susan May, treasurer of the Goose Creek Animal Sanctuary in Tallahassee. When a second thump failed to bring Perky round, veterinary surgeon David Hale tried manipulating the duck’s beak, before using a needle to shock her into consciousness. At one point the duck was given pure oxygen through a face mask, Ms May said. “At that point the vet turned and said: ‘I’m sorry, she’s gone. '” The room fell into shocked silence as those present took in the news, but then Perky raised her head and began flapping her wings. The relief reduced everyone to tears, Ms May said, describing one of her colleagues as “extremely emotional” as she left the room. “For the duck to have gone through all of this and then to die at that time was a real shock,” Ms May said. “This duck has taken us all on an emotional rollercoaster,” she said, adding that Perky has since recovered well and is staying out of trouble. Perky first made international headlines when she shocked a hunter’s wife who found her alive after being stored inside a refrigerator for two days. 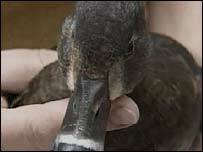 Mr Hale said the duck’s slow metabolism helped her survive the low temperatures for so long. Now volunteers at Goose Creek are hoping a t-shirt on sale through a local firm will raise enough cash to provide long-term care for the bird. Obviously this isn’t any sign of super duck intelligence, but it may be a sign the God is a duck, and is watching out for His kind.